The Royal Navy was to attain enormous popularity in Britain in the 19th Century, especially in its last decades. 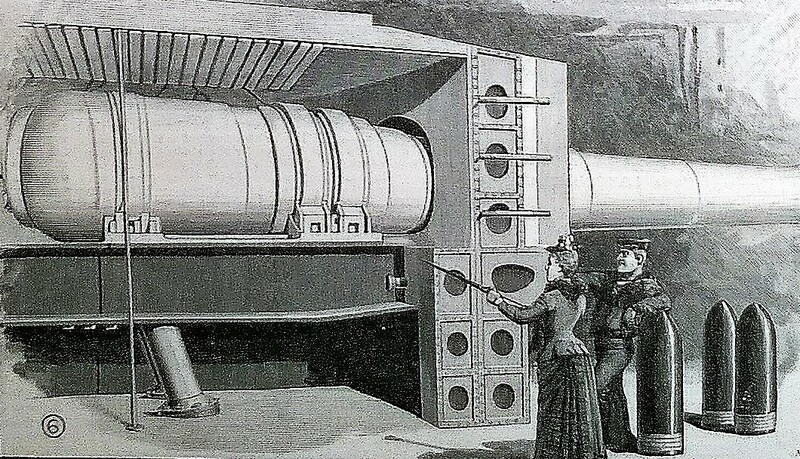 It was seen to be at the cutting edge of the technology of the time and to be the guarantor of imperial greatness against the machinations of the French, Russians and any other potential enemies, real or imagined. The main fleets in the Channel and the Mediterranean represented the most majestic concentrations of power afloat, dozens of cruisers and gunboats protected British commerce and interests in every part of the globe, and the navy was pre-eminent in charting the world’s oceans and coastlines and in creating the science of oceanography. The Navy’s popularity was seized on for use by commercial interests. 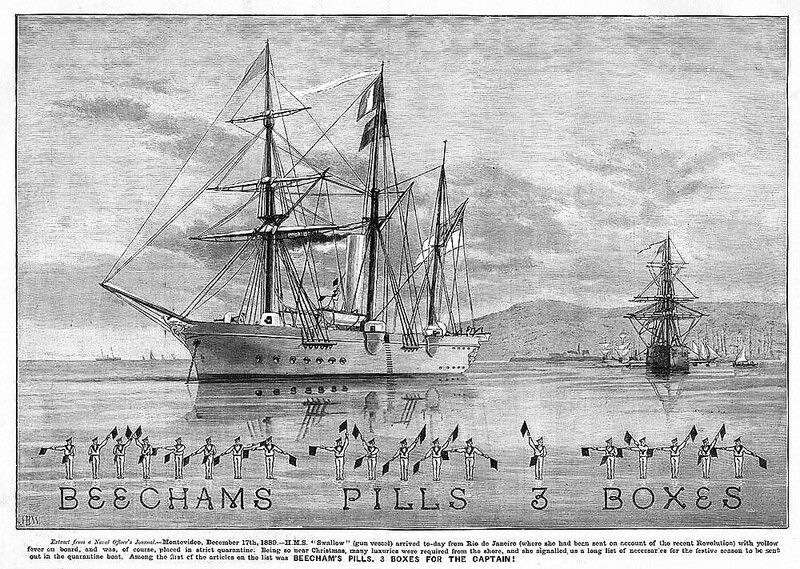 When HMS Swallow was quarantined outside Montevideo in 1889, due to a yellow-fever outbreak, her captain was alleged to have sent to shore for three boxes of Beecham’s Plls (“worth a guinea a box“). This advertisment commemorates this by flag semaphore! 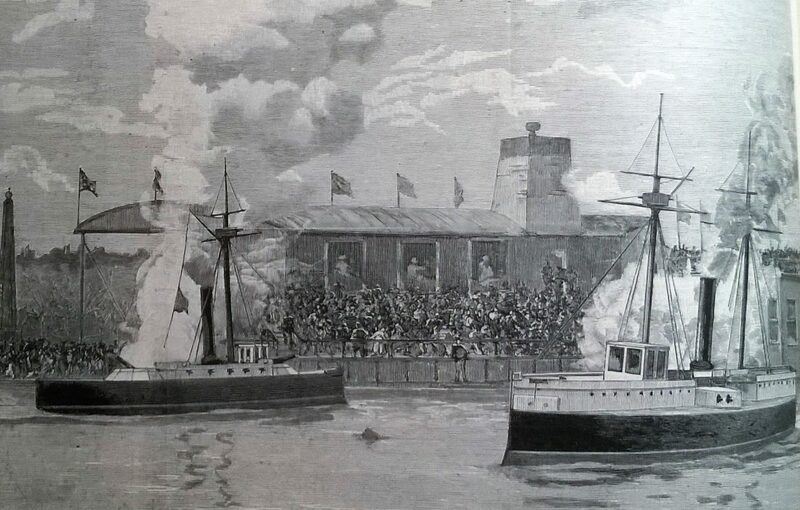 A large lake was constructed on which 25-ft models of the ironclads HMS Edinburgh and HMS Majestic blasted each other daily while smaller craft ran the gauntlet between two sea-forts, not unlike those in the approaches to Portsmouth harbour. These displays were immensely popular for their sound and fury. A decade later these models might have been powered by electricity but in 1891 it was necessary to propel them by a hidden crew of sailors turning crankshafts to drive the propellers (reminiscent of the ill-fated CSS Hunley!). Also hidden for sight was a helmsman who had restricted vision though the pilot house. The “Battles” were unrealistic in the extreme, the models lying very close together, but this did not bother the crowds, who delighted in the rolling smoke and darting flames of the blanks fired. 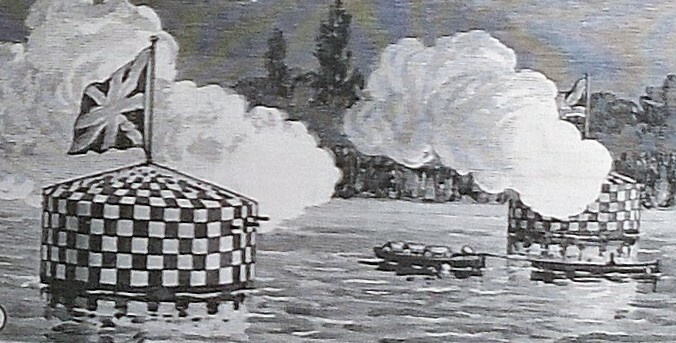 Night displays on the lake were particularly impressive, allowing demonstration of electric-arc searchlights, a novelty for the vast majority of the visitors. 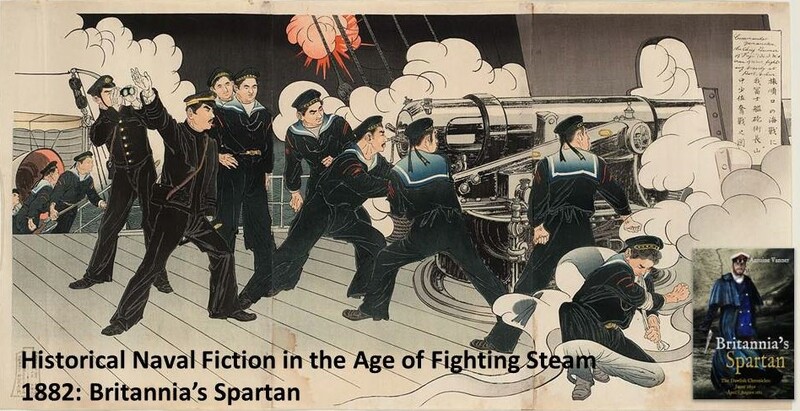 The fact that a large part of the navy’s duties in foreign parts was the landing of “naval brigades” – seamen and marines sent to fight ashore – was spectacularly demonstrated by running of field guns across an obstacle course. Most ships carried such weapons, which could be broken down into their components for manhandling and reassembled when needed to be brought into action. 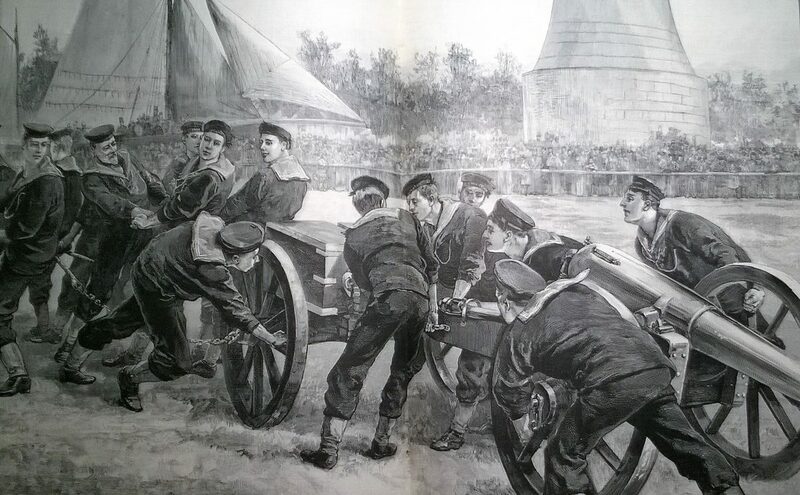 Such competitions are still held in today’s Royal Navy and are as spectacular today as they were in 1891. 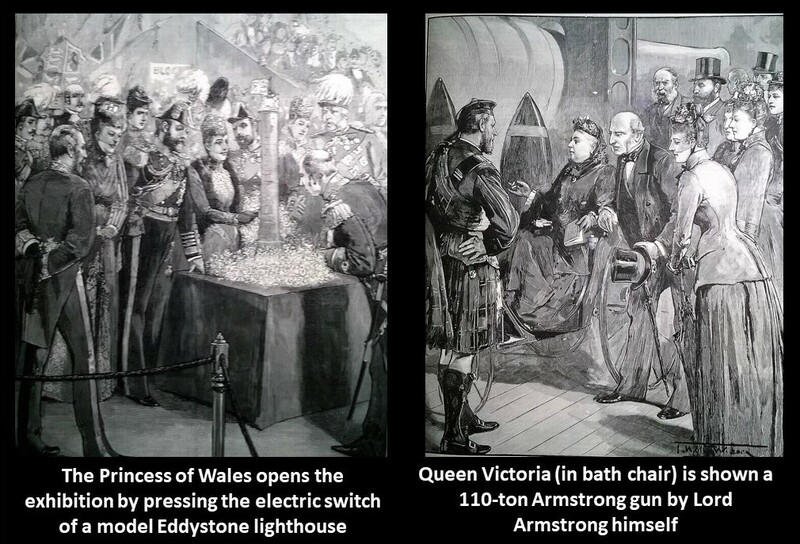 The exhibition was strongly supported by Queen Victoria and her family, being opened by the Prince of Wales (later Edward VII) and his wife – who dis so by pressing a switch to light up a model of the Eddystone lighthouse. 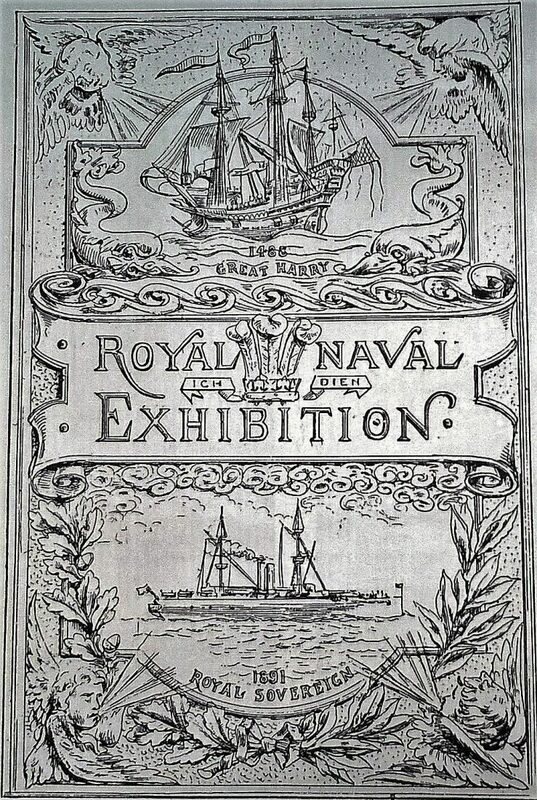 The exhibition was subsequently visited by the Queen herself, though judging by contemporary illustrations she seemed to have been pushed around it in a bath-chair. The exhibition was enthusiastically reported in the popular publications of the period – as the illustrations here show – and it drew enormous crowds. By the time it closed, after five successful months, it had attracted over 500,000 visitors and, after costs were covered, had raised some £50,000 pounds, equivalent to many millions today, for naval charities.